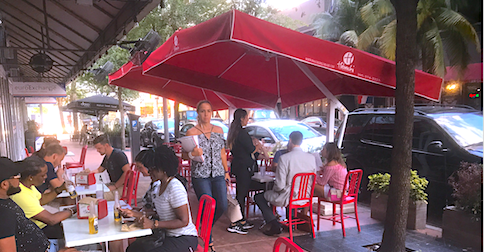 ​It’s going to be a long, hot summer, but ten (10) restaurants on NE 3rd Avenue (#Avenue3) in Downtown Miami have come up with a Summer Special. Ten Under $10 – each restaurant offers a Lunch Special including a beverage and all taxes for under $10. Explore the quaintest street in Downtown Miami, and stay tuned for upcoming #Avenue3 events and “urban activism” programs this fall. had hoped to turn out a group of speakers from the CBD to support the amended initiative, but here we are again. So it's time to start the emails, petitions, and letters, but most importantly, let's put together an articulate group of speakers to attend the City Commission meeting on Thursday. Everyone can speak for two minutes to express frustration that the CBD is literally being "peeled" off the map. Step 1: Mark your calendars for Thursday, June 22 at 9am. Step 2: Email (download.pdf) City Commission Chair, Vice Chair, and Commissioners. Step 3: Review the CBD Zoning Letter (download.pdf) and have your business, company, neighborhood/residential association sign on letterhead. Step 4: Stay tuned. It appears the item is moving forward on June 22, and that we need to show up and fight for the CBD, but . .